When I’m sick I experience sleep deprivation, memory blackouts and sensory overload. The less I sleep, the more manic I become with auditory, visual and tactile hallucinations. I can’t read or process speech. I have bipolar disorder 1 (BP1). 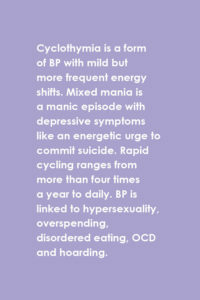 BP causes atypical shifts in energy from depression to mania that interfere with a person’s ability to function. Mania presents as euphoria, paranoia or anger. BP1 causes longer and more pronounced episodes of depression and mania than BP2. All forms of BP disrupt people’s lives even if you don’t recognize their struggle. I was diagnosed with BP when I was 13 because I exhibited suicidal ideation, self harm, painful anxiety and sporadic outbursts. It took me five years to accept my mental illnesses because I was socialized to believe they were onset by personal failure, not biological or environmental reasons. I also didn’t understand my disorder for so long because no one, including my psychiatrist, explained BP to me. I internalized stigmatization when I saw no information about mental illness in school, especially positive representation. This is systemic ableism — differently abled people are less profitable under capitalism. I committed to attending therapy and taking medication after my first five week manic episode at age 19, the beginning of self-investment when others wouldn’t. I empowered myself by using the internet to find BP studies, documentaries, support websites and emerging treatments. I take sleep, anti-psychotic, anti-anxiety, anti-depressant and mood stabilizing drugs. I fight everyday for a balanced life. Now I describe myself as neurodivergent: having a brain that functions in ways that diverge significantly from the dominant societal standards of “normal.” I’m not alone. Bipolar disorder affects approximately 5.7 million adult Americans, or about 2.6 percent of the U.S. population age 18 and older every year, according the National Institute of Mental Health. 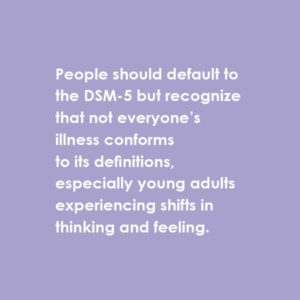 In general, young people are vulnerable to biological and environmental triggers of mental illness. 64 percent of young adults who are no longer in college are not attending college because of a mental health related reason. Depression, bipolar disorder and posttraumatic stress disorder are the primary diagnoses of these young adults, according to the National Alliance of Mental Health. Some people enter college with their BP diagnosis, but Dr. Shuyun David Lo, director of psychiatry at UC Santa Cruz Counseling and Psychological Services (CAPS), said many students will experience their first manic episode during college. Approximately 3.2 percent of college students meet the criteria for BP. Lo advised people to notice if a peer is behaving differently because they may not be aware of their mental health changes. like when Will Byers is perpetually burned in Stranger Things. When I’m manic I forget to eat or clean myself. I’m scared of passing out in public. 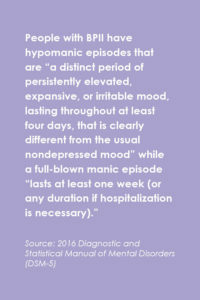 I actually think the term “bipolar” is more stigmatizing than “manic depression,” which was the official term for BP before 1980. The disorder goes beyond emotions. It’s rooted in disruption of sleeping patterns which dysregulates your circadian rhythm. As many as 1 in 5 patients with bipolar disorder complete suicide, according to the National Institute of Mental Health. 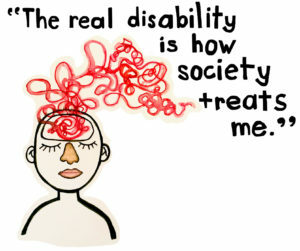 The real disability is how society treats me. An easy way to support someone is to be a positive environmental factor. Respectfully ask how you can help and if they’re in touch with a psychiatrist or therapist. Safely engage a manic person with a movie or crafting together. Sometimes I just want someone to send me memes. A sick person may need a ride, groceries or even a friend. It hurts to tell someone you have bipolar disorder and see fear in their eyes. Stigma comes from strangers. It comes from friends and family. It can even come from medical providers, who prescribe medication ignorantly and discriminate against the intersecting identities of patients like race and gender. You should be able to trust doctors who are a critical component of your mental health, so find one that’s right for you. It’s ok to shop around. I love that BP has made me empathetic. However, self-empathy is hardest to achieve. It’s devastating to realize the crash that follows the high. It’s tempting to forfeit the lifelong battle of BP in the midst of a manic episode. I remember that there’s a steady zone between mania and depression. Neurodivergent brains have vital and creative perspectives. I’m proud of my complexity and resilience.